The London Fly Fishing Fair is just a day away! This year the show has over 100 exhibitors selling the latest fly fishing tackle and accessories, along with fly casting demonstrations from the most influential anglers. Over 20 fly tyers from across the world displaying their talents, with talks and films illustrating different technics, and an amazing variety of global fishing opportunities. Last night on Anne Woodcock's weekly radio show her guests included the London Fly Fair organiser Fergus Kelly, angling celebrity Hywel Morgan, fly tyer Aimeé Kitching, designer Elaine Frost and myself chatting about the show and what visitors can expect to see. Listen again. The Dee are exhibiting with a stand overlooking the casting pool. Ross Macdonald will be tying a range of flies famous on the River Dee. This year we are welcoming to the FishPal stand Simon Clarke from the Tay Salmon Company. As always we will have the latest availability and advice for all things salmon, trout and grayling fishing. If you haven't already got your ticket, you can buy them online, or pay on the door. The show this Friday starts at 10am until 8pm and Saturday 10am until 4pm. Your ticket includes entry into the London Shooting Fair. We look forward to seeing you at the London Fly Fishing Fair this weekend. Ken Scott fishing Dochfour on the River Ness. "During the last week Knockando on the Spey have been picking fish up. 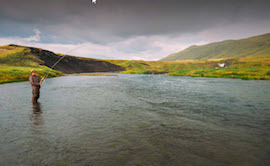 Knockando, Lower Pitcroy and Phones fishing has just recently gone live on the site and is already proving to be a popular choice for anglers. And why not? Once you have fished these beats you will want to go back again and again to this spectacular part of the Spey". "The Tay is fishing well. 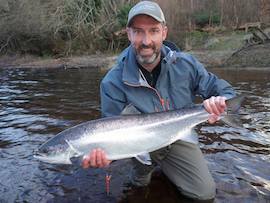 Great to see so many bars of silver starting to appear as conditions settle down and with the week ahead looking mild, a trip to the Tay would be well worth while if you want to get in on the action." "The Tweed after a week affected by heavy rainfall is now starting to fish. This week, fish are starting to be caught particularly below Kelso and again with good conditions forecast there will likely be good sport to be had if you can find your way to Tweed this week." "We are seeing increasing numbers of anglers contacting the office to book trips for April and May". If you are looking for advice on where to fish this year please give Tom a call in the office. The team have a wealth of knowledge and are speaking with ghillies, boatmen, owners and angling clubs on a daily and weekly basis. A day salmon fishing during the next few months can start from as little as £20 a day - find fishing. 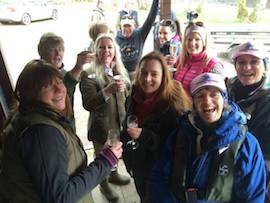 This October FishPal's Anne Woodcock has joined forces with Kate Innes from the Tontine Hotel to host a ladies fishing and spa event from the 15th to 17th October. This event is open to anglers and non anglers. Ladies will spend the day fishing Traquair Beat, one of the most popular upper Tweed beats at a prime time in October - read more. 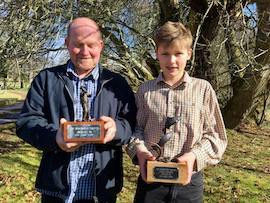 This years winners Craig and Harry. Last Friday Lady Haig welcomed guests to celebrate the winners of the Bemersyde Award for the best salmon caught and released on the River Tweed last year. Junior winner Harry Gotziem, aged 14, from Bedfordshire caught a 21lb salmon whilst fishing Traquair Beat last October. He caught his fish on a 11ft switch rod, fishing a cascade. Senior winner Craig Duncan fishing the Hawick Angling Club water on Teviot, caught and released a 26lb salmon. He was using a single handed trout rod - read more. Iain MacDonald from London caught this 17lbr on his first day on the Findhorn. The Findhorn. 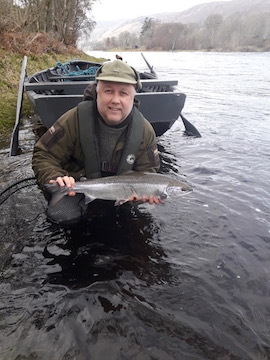 As we move in to the latter part of March and with some big Spring tides on the horizon this coming week, we may start to see one or two more fresh Spring salmon moving into the river - read more. The Dee. The fishing was slow, ending with sixteen fish in the book. Conditions were trying at times, with strong winds but that's March for you. Conditions look to be much improved this week, so let's hope there is good sport for the rods - read more. The Spey. There were only three or three and a half days fishing this week. Arndilly had three. Wester Elchies continues to fish well - read more. The Tay. Anglers who did brave the elements to wet a line on the Tay were rewarded as the river continued to produce some top-quality spring salmon. If the fishing conditions had been better, it is highly likely that many more salmon would have been landed - read more. River reports are uploaded by reporters nominated by the relevant river or area. You can find every river report under the section latest on the FishPal homepage. A day fishing during the next few months starts from as little as £10 a day for an adult and £6 for a junior - find fishing. If you are fishing the Spey, or even other rivers, please keep an eye out for adult salmon bearing tags. The Spey Fishery Board and Spey Gillies are running a salmon tagging project to determine the re-capture rate of released salmon. A full report on the tagging study will be published at the end of the season, including details of all fish caught - read more. Fin and Game have a fantastic offer on the Mackenzie G2 range with 35% off G2, DTX Shooting Head Fly Rods and G2 Fly Lines. The two rods both have a different action meaning there is something to suit everyone. The Shooting Head rods are a middle to tip action making them perfect for modern casting techniques and lines, whereas the G2 range loads a bit deeper, giving the angler more feel and a smooth casting stroke, making them more forgiving and suitable to a wider range of casting styles and lines. Please remember that the fish you are catching during Spring will be in the system until they have spawned. Take a look at the catch and release film The Gift, which we participated in along with the Atlantic Salmon Trust and the Angling Trust.